The challenge was to control the machine that used that lift to fly, and to do so in three dimensions. They recognized this challenge - itself a breakthrough - and solved it. They could control the airplane in flight around three axes. They eventually added a fixed vertical stabilizer for yaw control, later making it movable - thus becoming an all-moving rudder. But the other part of this two-part conundrum also had to be recognized and solved - namely Stability. Actually, they worked this problem first, experimenting for several years (1900-1902) on their gliders. This problem rears its ugly head because the Center of Lift over a wing surface interacts with the machine’s Center of Gravity. The two are rarely coincident to start with, and worse yet, move around a lot. The Center of Lift moves fore and aft as the speed varies, and also as the Angle of Attack changes. As it changes, it’s relationship with the CG causes a pitching moment trying to pitch the nose up or down. Without some means of stabilizing the machine, those moments will quickly cause the airplane to tumble out of the sky - controls or no controls. Movement of the CG was not so much a problem in those days, but certainly was as airplanes grew in size, with airplanes like the Concorde even pumping fuel fore and aft to precisely control the CG location. The Wrights solved the Stability problem by inventing a horizontal stabilizer, set longitudinally away from the wing far enough to give it sufficient moment arm to counteract the inherent pitching caused by the usual position of the Lift vector, most often aft of the CG. Their stab was in the front, and initially was a fixed surface, sized to do the job at the speeds they were flying. They incorporated this almost from the beginning on their gliders. They made over 1000 flights collecting data and making changes. When it came to their powered airplane, the stab became movable - in fact, it was an all moving surface now called a Stabilator. Stabilator might be viewed as a modern invention - but really stabilators came first. Today they are used on many high performance fighters, as well as a variety of other airplanes including the Piper Cherokee series and the Lockheed Tristar jetliner. The Wrights used a similar, all moving single-surface for their rudder - actually a pair of single surfaces located aft of the propellers. If you watch movies of the Wrights’ early flights, you can see how much activity their stabilator exhibits - in fact, it was very sensitive, requiring frequent and occasionally large travels. (See early flights here.) Their craft were light and flimsy and maintaining stability in pitch was obviously no easy task. After a few years, they moved it further forward to increase its pitching moment power - they were increasing the stability part of the equation and reducing the amount of control needed on a second-by-second basis. Later pilots and those flying recreated replicas have had extreme difficulty mastering the technique. But, the Wrights indeed DID master use of this control and made many flights, including many long ones, over a period of years, using their stabilator pitch control. Just another testament to their genius -- besides being brilliant engineers and inventors, they were extremely skilled pilots. Fixed horizontal stabilizer in the rear, with movable elevator. Note All-moving vertical stab. An upside down wing surface with a down lift vector, the horizontal stab counteracts the normal pitch down usually found when the Lift vector is aft of the CG. Its size could be varied by changing its distance from the wing Lift vector, thereby giving designers a lot of new flexibility. 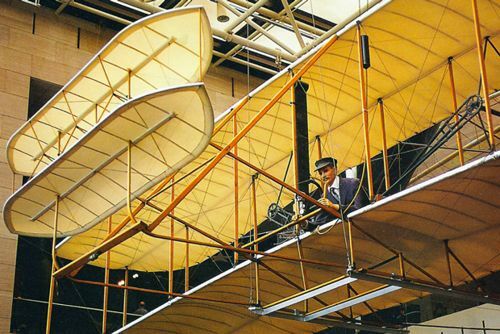 After a while, as airplanes grew in size and speed, and flew longer in cruise, pilots got tired of constantly holding pressure on the stick to maintain straight and level flight. Trim tabs were added to move the elevator a bit and ease the stick forces. 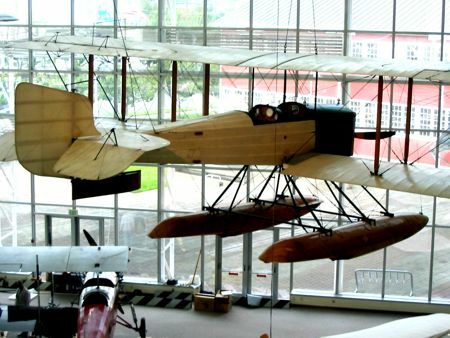 Initially, these were ground adjustable only, and set, through trial-and-error, to be effective at a certain desired speed and flight condition. Later, they became in-flight adjustable. As airplanes got faster, these deflected elevators adversely affected performance due to increased drag, so longitudinal trim was moved from trim tabs on the elevators to a movable stabilizer. A small movement of the stab equaled a large movement of the elevator, so the stab could be adjusted and the elevators returned to their in-trail faired position, reducing drag. Usually, the aft end of the stab was hinged and the front moved up and down by a control mechanism - usually a jackscrew. This schema has been in use for a long time, and inspection of a Piper J-3 Cub stab trim reveals very little difference from that found on a Boeing 707 or later jet transports. Not all trim systems use this scheme, however. Kelly Johnson, at some point decided that moving the horiz stab involved structural complexities that he preferred to avoid. In April 1947, he designed and patented an alternate scheme - - one in which the horiz stab was fixed to the vertical fin, and its AOA varied by rotating the entire fin assembly around a central pivot. This arrangement was especially attractive for horiz stabs mounted in mid fin (cruciform) or on top (T-Tail.) He immediately put that design to use on the XF-90 fighter and later on the Jetstar, which was designed and built in 1957. Jet transports brought two new wrinkles to the stab trim equation. Swept wings usually stalled from the tip inwards and hence moved the lift vector forward, causing a pronounced pitch-up tendency at stall. T-Tails, as noted in my Deep Stall article, dropped the tailplane into the wing’s turbulent wake during stall, causing a potential complete loss of effectiveness, and hence a Deep Stall, usually unrecoverable. Jets also brought a big increase in the longitudinal position of the lift vector resulting from a much greater operational speed envelope, and sophisticated leading and trailing edge high lift devices. Their stabs were correspondingly very large and very powerful. 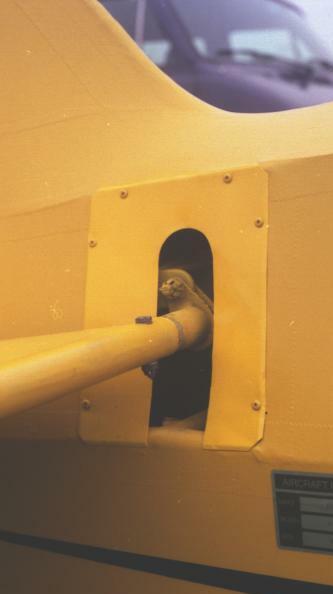 One of the first buggaboos experienced on the 707 / KC-135 was a worry about that powerful stab “running away” due to a system fault.. A stab lockout was devised, and those familiar with the 707 / 727 / 737 know that device, which is triggered by trimming the stab and then moving the column in the opposite direction. The stab locks out immediately with a loud crash as the lockout cams engage. The big trouble however turned out to be human caused. The first major accident I recall involving the stab was the NW 720B crash in the Everglades in 1963. The airplane was climbing out of MIA in an area of heavy convective activity. The pilot was possibly chasing airspeed and altitude and in a huge updraft, he applied large amounts of down elevator to counteract, accompanied by a large amount of nose down stab trim, when the elevator wasn’t enough. When the airplane exited the updraft and entered a large downdraft, the airplane was badly mistrimmed. The now opposing elevator loads can “jam" the stab - over-powering the stab trim motors used to move the jackscrew. (The only way out in this case, was to unload the stab by applying nose down elevator while retrimming the stab nose up - tough to do when you’re pointing at the ground!) An upset occurred and the airplane broke up during the subsequent dive. The stab was found at the nose down limit. That’s when the term PIO - Pilot Induced Oscillation - entered the common aviation lexicon. After a series of similar incidents and accidents in quick succession, including DC-8 accidents to Eastern climbing out of New Orleans and Trans-Canada climbing out of Montreal, pilot training moved to the now familiar Pitch and Power emphasis, where the airplane’s attitude and thrust are maintained at the expense of airspeed and altitude - and somewhat "loose" attitiude at that. After all these years, this topic is still front and center and is much discussed in the Forums concerning the recent AF 447 accident involving an A330 in a heavily convective situation and impaired Air Data inputs. ©2011 Robert Bogash. All Rights Reserved.